Tues. #2 is HERE. Please follow us on Tumblr or Twitter, subscribe to us on YouTube or like us on Facebook. Don't miss Glove Up or Shut Up at 8 PM ET! With the cheap plugs out of the way here's Wednesday's latest wrestling news. The YouTube subpocalypse is for real and my YouTube channel could use your support. I need 1,000 subscribers to survive and it's at 700 subscribers right now, an increase from when the bad news broke, but I still need 300 more. While the revenue generated is small compared to a Game Grumps or a NoDQ it's still very much necessary to keep our operation running. Please subscribe to Mistah MegaManFan and help me out! 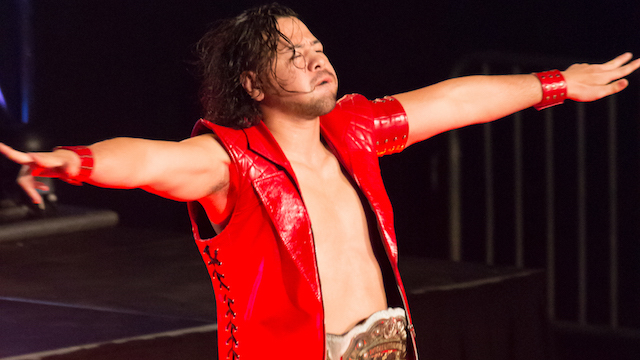 Shinsuke Nakamura's injury is legit -- he was BITTEN IN THE LEG BY A SECURITY DOG at the SmackDown live event in Bakersfield, California with no apparent provocation on his part. (PWI) Muzzle that pooch!! New WWE related videos including Raw and UK Tournament highlights plus SmackDown & 205 Live clips among other things can be found below. * Jimmy Havoc vs. Pentagon Jr. Here Pete Dunne talks about his WWE experience: "It's crazy. I think I'm in one of the best positions in all of sports entertainment. I really do have the best of both worlds - being able to experience things from our own U.K. show, to being on main roster tours, to being a part of NXT - all while still being able to take my own independent bookings and take the UK title with me. It's been a pretty surreal experience." I don't exactly recommend it but Steve Austin interviews Enzo Amore if you're interested.